Forecast for the week to come: expect lots and lots of haul goodies. Unexpectedly went down to the USA this weekend and went rummaging for goodies. I love how they have stores like ROSS which have designer goods at way low prices, I guess equivalently we have WINNERS but its no where near the same thing (inventory and price wise). There is one Betsey Johnson store in my city downtown and all their stuff is divinely girly and over the top. I'd wear her stuff all the time if i could. 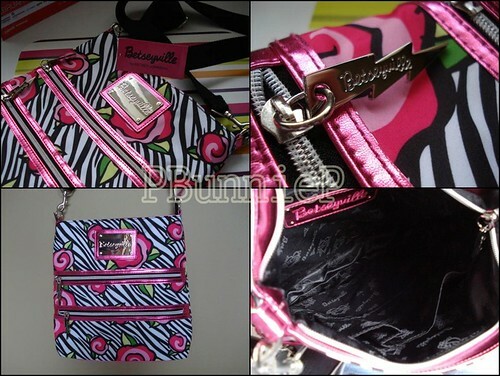 The bag is a cross body satchel type, durable with wild artsy rose prints and hot pink trim and lightening bolt zipper bits. I've been looking for something like this for ages! I have a small Fendi cross body but seriously it doesn't hold anything beyond my keys, cell phone and some candy. But my other bags are really quite large (I carry alot of baggage around *LOL*) so this in between size would be perfect. The design can be alittle overwhelming for some people but its definitely got sass. Next I went to the CCO (as usual) but mainly just to see what they have. I'm saving up for IMATS next month so I wasn't planning on getting anything. 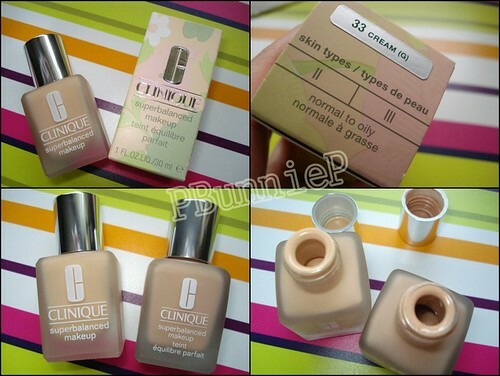 I spotted the Clinique SuperBalanced foundation line there though, almost all the colours and FINALLY found a great match. I really liked SuperBalanced but Clinique has horrible colours and the one I had just wasn't right. I picked up SB in "Cream"....compare it with my other bottle in "Cream Chamois"...see the difference? Or at least as perfect as I'm ever going to get from Clinique. Lastly, something really cool that I found also at ROSS. I wish Conair here had such spiffy gagets. These are hair rollers, but they are not velcro [ouch they can hurt] or foam. 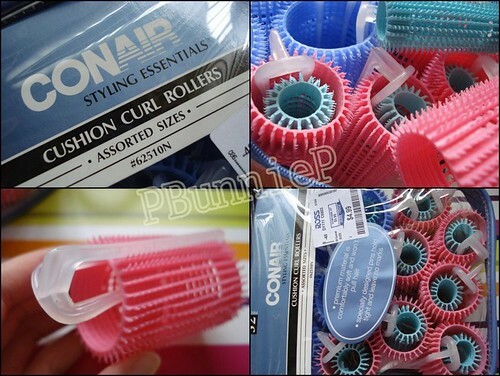 They are made of a rubber/plastic material and best of all there is a "clip" so you can secure your hair on the roller! *YEA!!!! Could this be the end to my hair curler woes? Since I have long hair now, I usually just curl the ends so hopefully these will help. The rollers come in a variety of sizes (3 sizes) and there's enough for your whole head for medium thickness hair. Stayed tuned for more goodies this week. Can't spoil you with too much in one post *hehehe* Not to mention I gotta get back to doing vidz since I'm finally getting my voice back. Have a great weekend everyone.